REQUIREMENTS:Macintosh computer with an optical drive supporting CD-ROM format and minimum 300-MHz or faster PowerPC G3 or G4 processor and built-in FireWire. * 256MB of RAM (384MB recommended for G4 real-time effects). Timing decision like: exactly how fast the title fades up or moves across the screen; the speed of a dissolve and when it starts or stops relative to the image; the speed and direction of a transition relative to the video and so much more. These decisions do not necessarily need to see video in its true colorspace or at full quality to make decisions and speed productivity. While Apple don't particularly like the term, this is real-time editing because there is NO waiting while you make effect timing decisions. 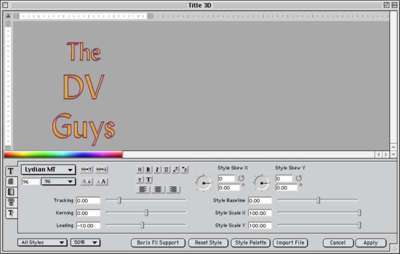 There is a one-off render to DV at the end but there are not 5, 10 or 20 renders while you experiment to get the timing right. real-time Still Frames from Video stills or imported graphics play in real-time at preview resolution. There is no restriction on the number of stills in the Sequence, although more stills require a larger RT Still Cache to be set in General Preferences. 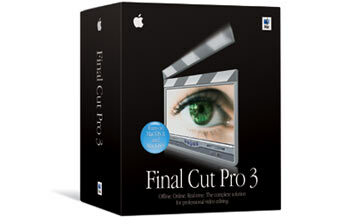 When you're ready to make the transition to OS X Final Cut Pro 3 will be there and will integrate into an all OS X workflow. The look is still mostly the same Final Cut Pro appearance we've loved for nearly 3 years with only basic compliance with the Aqua interface guidelines. Personally, having seen what at least one other NLE has done with OS X conversion I was hoping for an Aqua remake. And sometimes the Aqua elements in the original interface look out of place. Having seen what was done with QuickTime Player and iTunes in the OS X conversions, I think it would be possible to retain most of the familiar look and yet give it an Aqua look and feel, but no doubt there will be future OS revision for more OS X Aqua compliance. From a purely personal business motivation, I'm pleased the interface is substantially the same as it will make an OS X compatible version of the DV Companion - The Intelligent Assistant for Final Cut Pro 3 much less work than remaking all 3 hours of sprite movies. Broadcast Safe with no fancy interface but 5 preset level settings from 'Custom' - you're on your own - to Extremely Conservative. Broadcast Safe is used in conjunction with the new Range Check feature. Range Check a Green (getting close) or Red (out of range) Zebra pattern for excess Luma Levels or Chroma Levels (or both at once). With Range check you can be sure, no matter what the input source, that the output is within broadcast safe. Range Check is independent of the Broadcast Safe Filter. And that is exactly what it is. A new version of the PhotoJPEG codec that is accelerated by the G4 Velocity Engine and an Easy Setup for NTSC and PAL that captures DV directly to the PhotoJPEG codec at 320 x 240 and 35% compression. Net result - 9 times the offline storage capacity - an impressive 45 minutes per Gigabyte! The data rate is sufficiently comfortable to work from an internal drive in iBook or PowerBook. A 45 GB FireWire drive, powered from the FireWire bus, holds more than 30 hours of offline-quality storage, vastly superior than the Avid AVRs of days gone by. 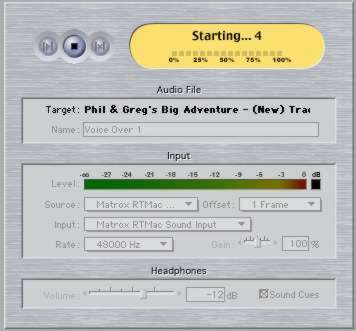 Voice Over is simple to use - set the input from the available inputs - and click on the record button. 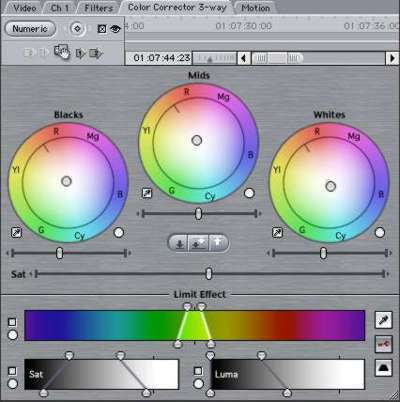 Inputs can be from the RTMac card with a line level feed from a mixer which is what I use; USB microphones or microphone adapters ; multi-channel FireWire input, or at a pinch, the microphone of a DV Camcorder. As long as Final Cut Pro recognizes it as a valid QuickTime audio digitizer, you can use it for Voice Over. Voice Over gives visual (and optionally audible) lead in queues and a warning 15 seconds from the end of recording range. Once recorded to RAM it's is processed and saved to the drive and automatically added to free tracks in the Timeline. It just works, although I found I preferred the audible warnings off unless the microphone was removed from the headset used to monitor. 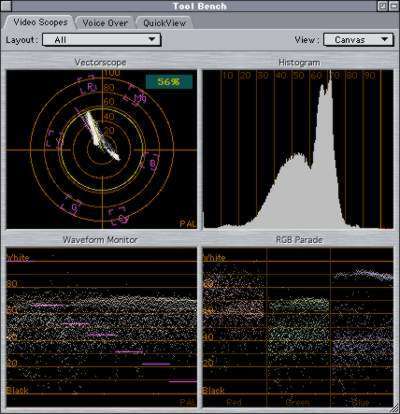 Provides is a Vectorscope for color measurement; Waveform monitor displays levels, RGB Parade for levels in each color channel independently and the Histogram parallels the histogram in Adobe Photoshop. (Sadly, you still need Joe Maller's Levels filter to make optimal use of the Histogram). Save you Screen and Bin layouts to files to restore them later - or transfer them to another workstation (take you screen layout with you). Range Check - although mentioned before it's worth mentioning this new feature that displays zebra stripes on excess chroma or luma levels. Set Opacity lines on a Clip no longer requires the entire Clip to be rendered - only the sections with opacity changes need to be rendered. What's missing? No integration with FilmLogic other than what already existed and no multi-camera features - but both were acknowledge as being "important". Important features missing from previous releases turned up later, so I believe we'll see more, soon. Philip Hodgetts is the author of the DV Companion and co-developer of the Intelligent Assistance approach to "What you want to know, when you want to know, how you want to know." Philip has had his own video production company since 1980 and worked on everything from long form documentary to corporate video to national TV commercial (Australia) with a strong emphasis on education and training video production. it's formal release in 1999. As well as continuing to edit a documentary 'trans-Pacific' from Los Angeles by sharing Project files with a producer in Sydney, he is currently busy updating the The Intelligent Assistant for Final Cut Pro - DV Companion to add in all the new features of Final Cut Pro 3. In his business life he's developing the concept of Intelligent Assistance even further and in his spare time developing an new concept in 'documentary' deliver for demonstration at QuickTime Live in February 2002.